In response to a slew of critical comments by US Secretary of State John Kerry and his spokesman against Israel as it defends itself from a wave of Arab terror, Republican presidential candidate Senator Ted Cruz (R-TX) on Friday demanded Kerry's immediate resignation. Cruz's call comes in response to Kerry blaming the terrorism on "Israeli settlements" in an interview Tuesday, a statement his spokesperson John Kirby later tried to backtrack on. Kirby himself had to issue a semi-retraction after falsely blaming the terrorism on Israel for changing the "status quo" on the Temple Mount on Wednesday, and likewise delegitimizing Israeli self-defense by claiming there are "credible reports" of Israeli "excessive force." The State Department spokesperson also accused Israel of "terrorism," saying "individuals on both sides of this divide are - have proven capable of, and in our view, are guilty of acts of terrorism." "Once again Sec. Kerry and his staff have proven themselves utterly unfit for the positions they hold,” Cruz told the Washington Free Beacon on Friday. Cruz's calls mirrored those of Representative Lee Zeldin (R-NY), who urged US President Barack Obama to fire Kirby in a statement on Thursday. "It is absolutely disgusting and shameful that the Obama administration not only refuses to stand strong with our ally in Israel, but actually has the audacity to claim that the Israelis are guilty of terrorism,” Zeldin said. "Admiral Kirby’s accusation warrants his immediate removal. He should absolutely not utter one more word on behalf of America’s foreign policy. 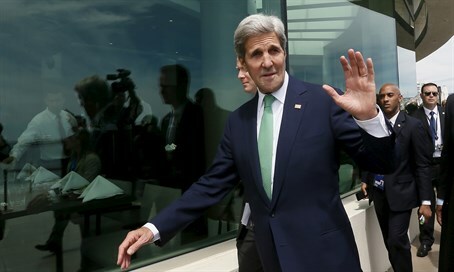 If Secretary John Kerry refuses to speak out and discipline Mr. Kirby than Secretary Kerry needs to step aside as well,” he added.